the cool thing to do. Big tobacco companies helped make sure of it, downplaying the health hazards and playing up the smooth, sublime inhale of a satisfying cigarette. The health issues eventually became too colossal to ignore, with their hazards trumpeted across the land in the media, on teen-oriented TV shows and pretty much everywhere else you turned. Quitting smoking then became the cool thing to do, primarily for your health but also to avoid ostracism – by your friends, your pet cat and society as a whole. The idea of electronic cigarettes quietly tiptoed onto the scene, providing an alternative to smoking that purported to be healthier, safer and not as offensive to the nose. In a perfect world, no one would smoke. But can we make smoking cigarettes a thing of the past? Perhaps. 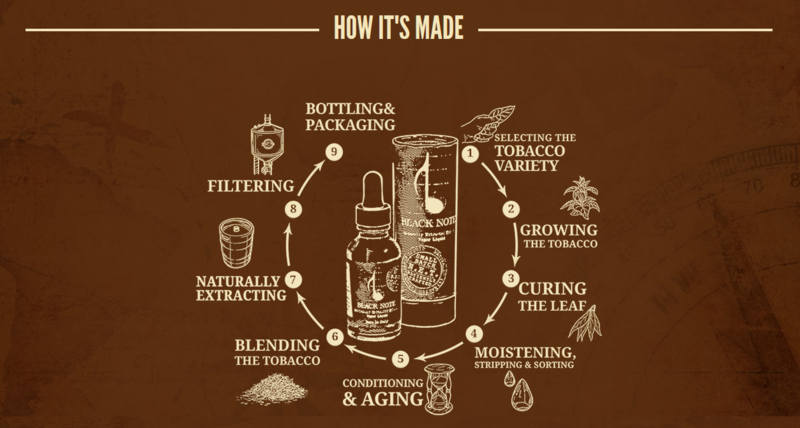 At Black Note, that is in its purest essence our mission: To help create a smoke free world by providing the most authentic and enjoyable alternative to smoking. That is why we decided not just to make a better e-liquid, but to challenge other e-juice companies by creating a vape liquid that is remarkably different and superior in every way. Pleasant and FlavorfulBlack Note Concerto 30ml Maker's NoteCuban Cigar Blend High-quality cigar tobacco grown in moist tropical climate delivers flavor notes that range from slightly sweet to mildly s.. Pleasant and FlavorfulThis item is for JAPAN Domestic Shipping onlyBlack Note Concerto 30ml Maker's NoteCuban Cigar Blend High-quality cigar tobacco grown in moist tropical climate delivers flavor not..
Rich and SmoothBlack Note FORTE 30ml Maker's NoteBurley Tobacco Burley tobacco provides a rich, smooth experience in this crowd favorite. Cultivated on the foothills of Italian volcano Vesuvius, the t..
Rich and SmoothThis item is for JAPAN Domestic Shipping onlyBlack Note FORTE 30ml Maker's NoteBurley Tobacco Burley tobacco provides a rich, smooth experience in this crowd favorite. Cultivated on the..
Earthy and nutty Italian Kentucky tobacco Black Note LEGATO 30ml Maker's NoteItalian Kentucky TobaccoEnjoy the earthy and nutty flavor of real Italian Kentucky tobacco, flue-cured to release the plant..
Earthy and nutty Italian Kentucky tobacco Black Note LEGATO 30ml Maker's NoteEnjoy the earthy and nutty flavor of real Italian Kentucky tobacco, flue-cured to release the plant’s natural resins. This ..
Airy and bright Virginia tobacco Black Note PRELUDE 30ml Maker's NoteVirginia Tobacco Virginia tobacco sets the stage for the light, bright and naturally sweet taste of Prelude. Grown in the sandy soi..
Airy and bright Virginia tobacco This item is for JAPAN Domestic Shipping onlyBlack Note PRELUDE 30ml Maker's NoteVirginia tobacco sets the stage for the light, bright and naturally sweet taste of Pre..
Smokey & Peppery Latakia tobacco blend Black Note Quartet 30ml Maker's NoteLatakia TobaccoA rare blend with a remarkable flavor, Syrian Latakia tobacco is sun-cured and then smoke-cured using arom..
Smokey & Peppery Latakia tobacco blend This item is for JAPAN Domestic Shipping only Black Note Quartet 30ml Maker's Note A rare blend with a remarkable flavor, Syrian Latakia toba.. Robust and IntenseBlack Note SONATA 30ml Maker's NoteCavendish Blend Dark ripe Virginia tobacco is treated to a centuries-old curing process, producing a robustly rich and intense blend. Virginia toba.. Robust and IntenseThis item is for JAPAN Domestic Shipping onlyBlack Note SONATA 30ml Maker's NoteCavendish Blend Dark ripe Virginia tobacco is treated to a centuries-old curing process, producing a r..